With beacon support, your Intuiface experiences can uniquely identify each item brought near. React in real-time via push notification, showing in-context information on the fly.  Beacons, particularly popular in retail, are low-energy devices broadcasting either a unique identifier or a URL. By assigning a beacon to individual items or by sending beacon notifications, content providers can create a contextual bridge between product/service/information displays and the actual product or a mobile device. Thanks to this omni-channel scenario, visitors can take information about a given item with them, making the content "stickier" and thus more influential and memorable. The effect is so pronounced that interactive digital signage and beacon technology have been labeled the new power couple. Detect real-time change in distance separating a beacon-tagged item and an Intuiface-based digital sign. For example, create signage that displays information about an item lifted off a shelf (Lift & Learn) or placed in a specific location (Bring & Compare). Detect beacons and show related content. For example, gallery visitors holding iPads running Intuiface-based experiences are presented with information about each beacon-tagged work of art as they are approached. Broadcast a URL using the Eddystone-URL protocol. For example, run ads in Intuiface-based kiosks that – when touched – broadcast URLs for associated coupons. There are a number of apps available on Android or iOS to capture these URLs, making the Physical Web™ accessible to anyone with a mobile device. Couple beacon usage with Intuiface Analytics to collect deeply contextual information about your users. Provide customers instant offers and reward frequent shoppers with loyalty programs. Enable Proximity Marketing, Lift & Learn or Bring & Compare scenarios. Place beacons at individual exhibits to create an automated tour guide. Communicate show times, trailers, ticket prices, and seating availability. Reward frequent guests, inform diners of daily specials, provide menu and pricing information. Greet visitors and provide additional information and schedules. Trigger audio content to help users navigate through your venue or provide comprehensive visual instructions. 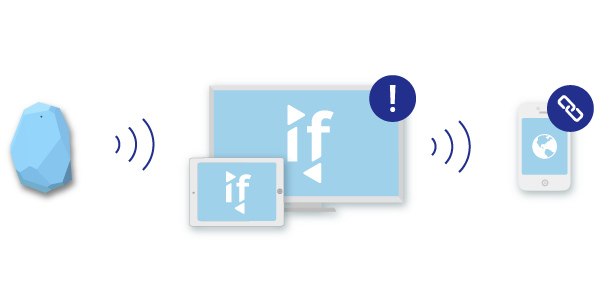 Intuiface’s beacon implementation is compatible with iBeacon™ and Eddystone™ devices. Intuiface Composer running on Windows 8.1 or 10. Intuiface with Beacons is available now. Read our knowledge base Beacon overview article to learn more. Try it for yourself! Get our Beacons Sample!